Sad the bullfighter died. Now the bull has to die and all its family (quite probably this already happened). I don’t see a reason to keep this kind of events alive. What’s the reason to have to kill an animal that doesn’t know that the hell is happening. Just by sport?, feeling superior to other species? 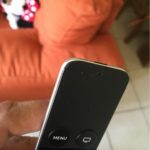 It’s not fair, most adults have the ability kill a bull (with a weapon), I don’t see something respectable in fighting a bull that has been bleeding, that was deteriorated before the “fight”, a fight that is expected to lose. The only way to win is to provide a “good” show, but the bull doesn’t know about that, it is not trained to do that and the chances to do it are pretty low. 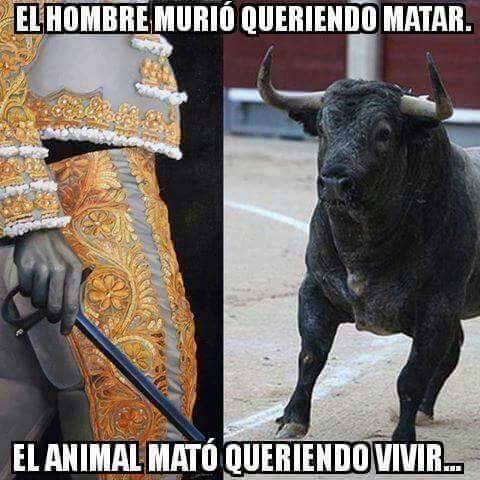 It’s definitively not fair, that if the bulls kills the bullfighter then the bull and all its family is killed, but if the bullfighter kills, he and his family remains alive!, I don’t see anything honorable on that. I’m completely against this kind of shows, the bullfighting, dog (or any other animal) fights, any kind of animal suffering just for entertainment is wrong and should be treated like a crime. I do think there are other ways to create a good “show” with bulls, like doing a bullfight without making the bull suffering, letting the fighter prove his manliness by fighting a 100% complete bull, again, without suffering. “Dancing” when the fighter evades the bull, respecting it. Then, let both animals remain alive, I’m sure that a trained bull will give a better show, a show that proves the respect between humans and animals, that fills the hearts of the audience with good, with love, the audience will leave the place feeling great because they were witness of a good example of human kindness.